LA CROSSE, Wisconsin – The 2018 NCAA Division III Outdoor Track & Field Championships concluded Saturday afternoon at the Veterans Memorial Field Sports Complex and as expected, both races for the team titles came down to the 4×400 relay. 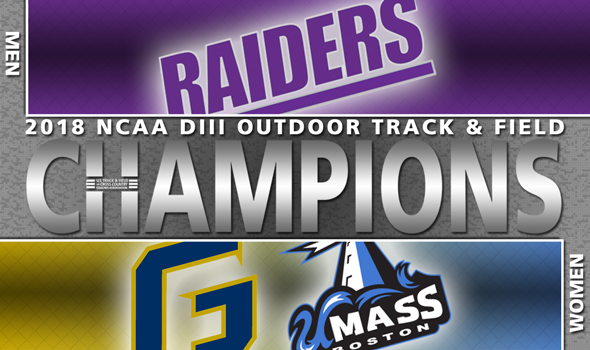 When the dust settled in La Crosse, Wisconsin, Mount Union captured its second men’s outdoor team title in program history, while the women’s team title was shared by George Fox and UMass Boston, the first time that there were outdoor co-champions since 2008. Mount Union entered the final track event of the day trailing North Central (Ill.) by four points, 30-26. For the Purple Raiders to sweep the track & field slate clean (They also won the indoor team title), they had to finish no worse than third in the relay and beat the Cardinals by at least three spots to clinch at least a share of the crown. At the final exchange, Mount Union sat second behind Wesley, while North Central (Ill.) was running strong in fifth. The Purple Raiders weren’t in second for long as A.J. Digby tore around the track. Digby closed in 44.72 and powered past Thomas Kalieta Jr, Wesley’s anchor, in the final 10 meters for the win. It was an incredible afternoon for Digby, who also won the open 400 title and became the sixth fastest performer in NCAA DIII history in the process. Mount Union pushed its score to 36 points and once Peyton Piron, who ran the anchor leg for the Cardinals, finished fourth, the championship celebration could commence. In addition to those victories in the 4×400 and open 400, the Purple Raiders received 10 points from Mason Plant’s win in the 110 hurdles and two each from athletes in the javelin, pole vault and shot put. North Central (Ill.) ended up with 35 points as a team. Dhruvil Patel scored 15 of those points by himself after winning the 10,000 on Thursday night and finishing fourth in the 5000 this afternoon. Rowan and Benedictine (Ill.) rounded out the podium in third and fourth place, respectively, with 27 and 26 points. Over on the women’s side of things, George Fox led UMass Boston by one point with the 4×400 relay to go. If the Beacons finished seventh or better, they would have won the title outright since the Bruins didn’t have a relay team entered. UMass Boston, with Wadeline Jonathas running the third leg, came in eighth place. The Beacons were 0.42 seconds from seventh, which was occupied by Washington (Mo.). Jonathas had another standout performance at the national meet for UMass Boston. The sophomore from Haiti became the first woman to repeat as double champion of the 200 and 400 since Wheaton (Ma. )’s Amber James in 2003 and 2004, was part of the Beacons’ 4×100 and 4×400 relay teams and finished fifth in the long jump. George Fox spread its scoring out as it tallied points in seven different events. The Bruins won the 4×100 relay title on Saturday, while Annie Wright, Dakota Buhler and Stacy Kozlowski notched top-3 finishes in the heptathlon, long jump and high jump, respectively. Washington (Mo.) took third in the team standings, while Claremont-Mudd-Scripps held off Emory for the final podium spot.